Power Couple, Covering War (And Waging Their Own) Martha Gellhorn was one of the first great female war correspondents. But her reputation as a journalist was sometimes overshadowed by her marriage to Ernest Hemingway. A new HBO film looks at the relationship between this passionate power couple. 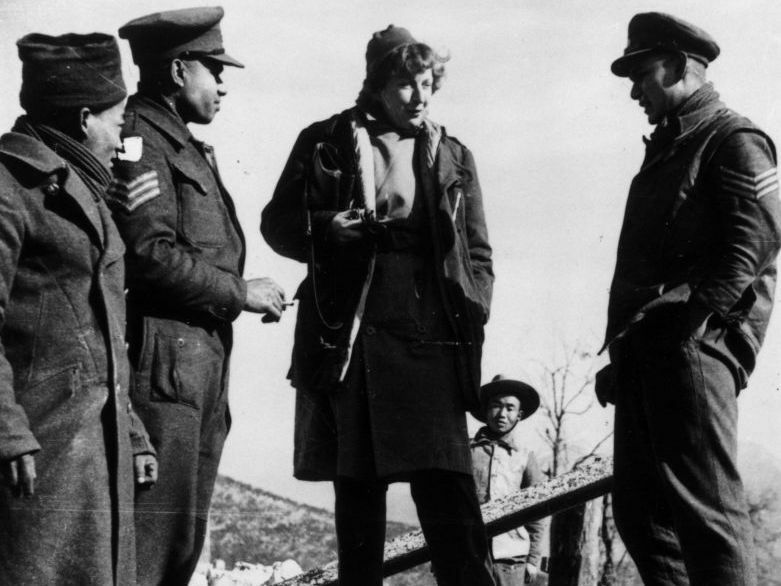 Before Christiane Amanpour, before Ann Garrels, before Lourdes Garcia-Navarro, there was Martha Gellhorn, one of the first great female war correspondents. From the Spanish Civil War through Vietnam, she covered every major conflict of the day. But Gellhorn's reputation as a journalist was sometimes overshadowed by her marriage to one of the great American writers, Ernest Hemingway. HBO has made a film about Hemingway and Gellhorn, starring Clive Owen and Nicole Kidman. The movie puts the spotlight back on the lady in question, a striking figure — leggy, smart and impassioned. In 1983, a British TV interviewer posed this loaded question to Gellhorn, then 75 and still gorgeous: "I.F. Stone once described governments as comprised entirely of liars and nothing they say should ever be believed." The response was a typical no-holds-barred Gellhorn opinion: "Quite right. And Tolstoy once said governments are a collection of men who do violence to the rest of us. Between Izzy Stone and Tolstoy, you've got it about right." Gellhorn felt her duty as a journalist was to bear witness. She told stories not of generals and politicians, but of powerless people — the victims of war. Biographer Caroline Moorehead says that for Gellhorn, it was less a job than a calling. "I think she felt all she really could do was write," Moorehead says. "It was all she knew how to do. And she was still feeling that in her 80s. And since nobody else seemed to be writing — to her — about the children and napalm in Vietnam, then even though she was getting on and she wasn't accredited to a newspaper, well, then, she'd go and write about it." But HBO's film suggests Gellhorn wasn't always that way. In 1937, trying to cover the bloody Spanish Civil War with her lover Hemingway, she runs to his hotel room. 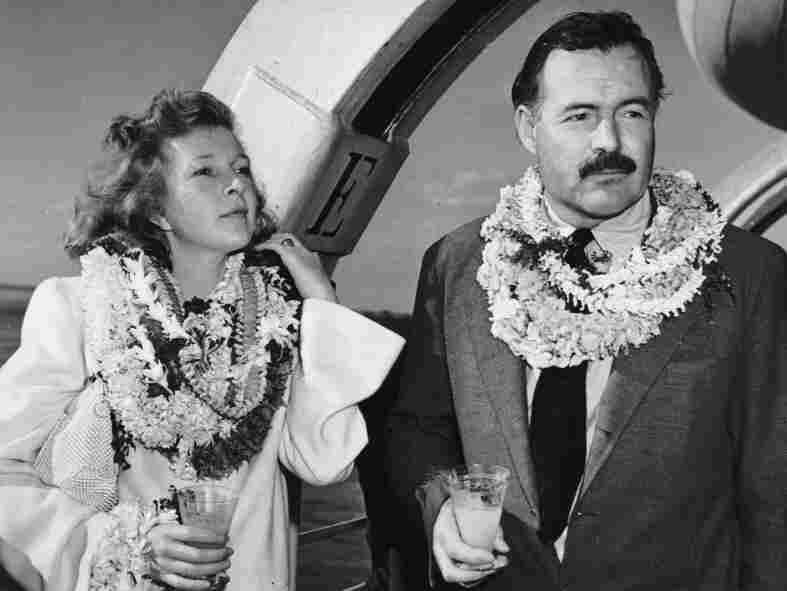 1941: Hemingway and Gellhorn, married in 1940, stand on deck aboard a ship, wearing leis and holding cocktails. They divorced in 1945. "He's typing away furiously, sort of pages falling to the floor," says actress Nicole Kidman. "And she's like, 'Help, I've got nothing. I don't know how to write about it. I'm seeing all of these things, but I don't know how to write about it, because really I just want to write about people.' "
In the film, Hemingway replies: "Do what you did in Appalachia. Write about ordinary people and war and Madrid. ... Get in the ring, Gellhorn. Start throwing some punches for what you believe in." "Basically, he pushed her into her style of writing, [which] then became so famous," Kidman explains. Philip Kaufman, who directed Hemingway and Gellhorn, says that scene is rooted in the truth. "She was learning her craft," he says. "You could pass a high pile of rubbish and smell suddenly the sharp, rotting smell of the dead. Further on would be a half-decayed carcass of a mule, with flies thick on it, and then a sewing machine by itself blown out into the street. It was sunny and quiet, and the whole place was infinitely dead." Gellhorn had her own style, although Hemingway's influence is clear. Preparing for the role, actor Clive Owen read all the Hemingway he could find. "It's so economical, it's so concise," he says. "He can, in just a few sentences, create whole worlds and whole relationships. It was such a lesson in sort of discipline and economy." There was little about Hemingway himself, of course, that was restrained. As a person, he was famously larger than life. "Charismatic, compelling, magnetic, destructive — you need more words?" Kidman laughs. "Extraordinarily talented, selfish, yet a great teacher. Thank God he was around." Hemingway was 37 and famous when he met Gellhorn. She was 28, building a professional reputation. "I think he met his match, really, in all sorts of ways," says Owen. "It was hugely passionate. It was an epic romance." In Italy in 1944, Gellhorn talks to Indian soldiers of the British army on the 5th Army's Cassino front. They married in 1940. Four years later, she expected to cover D-Day for Collier's magazine. By that point, her marriage was fraying, and when Hemingway took the job instead, the indomitable Gellhorn stowed away on a hospital ship and beat her husband to Normandy. The day World War II ended, she went to a German concentration camp. On British television, Gellhorn described her reaction to the atrocities she witnessed there. "I got out of Dachau in a state bordering on uncontrolled hysteria," she recalled, "and went and sat in a field waiting to be removed with American prisoners of war." Compassionate and driven, Gellhorn has been described as a kind of adrenaline junkie — someone whose motives may have gone beyond simply bearing witness. "There's that amazing line they came up with," says Kidman: " 'We were great in war. And when there wasn't a war, we created one of our own.' When they could be in the midst of the chaos and the war, and they could be writing, and they could be charged up by that ... even though they're tragic events, that somehow fired them up. I think there was an adrenaline that propelled her with that. But you're not going to do that unless you really do want to be a witness. You know, it's not like she did it for a decade. She did it for a lifetime." Gellhorn's impulse to witness, to travel, affected her marriage to Hemingway; they divorced in 1945. "She refused to kind of live her life through him," Owen says. "He would have preferred her to just hang with him while he wrote novels, and she wanted more than that." And Gellhorn got more, for the rest of her long life. She was 89 when she died, in 1998. (Hemingway committed suicide in 1961, at age 62.) Film director Philip Kaufman says that in her grace under pressure, her courage and her terse prose, she carried on the Hemingway legacy. "Martha Gellhorn, for 30 years after Hemingway's death, in a way was the bearer of the Hemingway code," Kaufman says. "She went to all the battlefields of all the major wars of her time. Whether he 'made' her or not, she certainly carried that spirit. And she outdid the master."